Google Maps as a Sculpture is a new work by Jan Robert Leegte (1973, Netherlands). Leegte was among the first artists who were involved with Internet art in the 1990s. 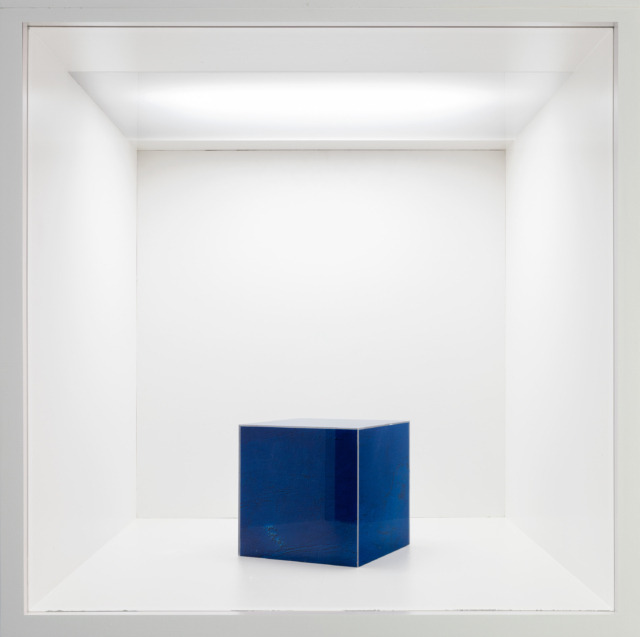 Since 1997, he has become known for creating art in the form of websites, which he frequently connects to art historical movements such as minimalism, land art and conceptualism. Leegte also translates the themes of his work to offline media such as print, sculpture and projections. By transposing digital interfaces, browser windows and ‘on-screen’ graphics into physical objects, Leegte’s ending results are thought provoking and at times comical. Since his practice began, the internet and its offerings have become more advanced and evolved than ever. 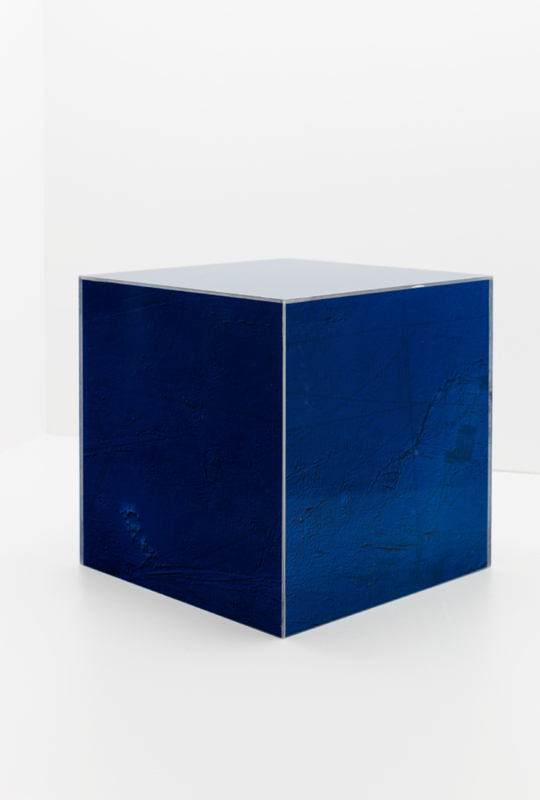 Here, in Google Maps as a Sculpture, we see a portion of perhaps the most revered accurate mapping there is today (Google Maps) wrapped around a cube. We assume the surface of the map represents an actual location/s on the planet. However, out of context and being randomly obtained, we do not know where. Printed, manipulated and presented in this physical format, Leegte highlights how easily this accurate information is rendered useless, through simple sculptural abstraction. The exact location on the map, whilst it must exist, remains obscured,transforming into a material surface. Jan Robert Leegte (1973, Netherlands ) lives and works in Amsterdam. In his works he investigates the sculptural materiality of digital interfaces, online and offline. Leegte graduated from Willem de Kooning Academy with a BFA in Interaction Design in 1999. He has curated exhibitions at LIMA, Amsterdam and Rietveld Academy and others. He received artist grants from Künstlerhaus Buechsenhausen (2009), Mondrian Fund (2006, 2003) and MuseumsQuartier Vienna (2005). 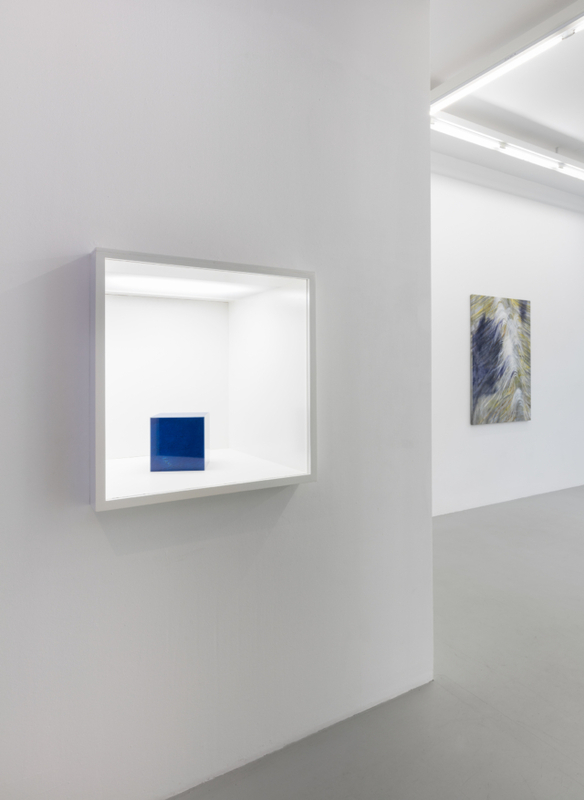 Solo exhibitions include: Sculpting the Internet – Upstream Gallery, Amsterdam (2017); On Digital Materiality – Carroll/Fletcher, London; New World – Link Cabinet, Link Art Center, online (2016); Mountains, Drop Shadows, Source Code and Stuff – Joey Ramone Gallery, Rotterdam (2013); Circling the Prey – HB Galerie, Rotterdam (2010) and site:specific – W139, Amsterdam (2000). His work has been shown internationally in group exhibitions at The Société, Brussels; Whitechapel Gallery, London (2016); Ileon, Mexico City; Kunsthal KAdE, Amersfoort; Rijksmuseum Twente, Enschede (2015); MOTI museum, Den Bosch (2014); Arti et Amicitiae, Amsterdam; KM Temporaer (2013); Kunstverein Medienturm, Graz (2008); The Netherlands Foundation for Visual Arts, Design and Architecture, Amsterdam (2006) and Künstlerhaus, Vienna (2003) among many others.